Experience The Phantoms of The Mansion of Terror, The new SlaughterHouse, Wicked Darkness, and The Zombie City Factory. 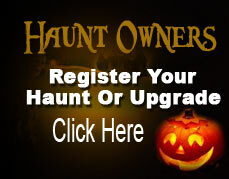 Each haunted house is 25-45 minutes long depending on the individual and how fast you move through the haunted houses. Children under 13 can go through with a parent. We are located in the lost pines area of Bastrop County, just south of the city of Bastrop. Because we’re in the county, we are listed as Smithville.